Living a rootless life is difficult, and when your life contains more questions than answers, one thing leads to another. Such is the case for Jillian James. Never having a home for more than two years, a habit she inherited from her father, she’s now seeking answers to why her father left her at university, why they never stayed anywhere for long, or anything about her mother. Starting with a random zip code one of the few bits she has from him, she decides to start her search in Laurel Springs. Planning on staying no more than three months, Jillian meets Conrad, mayor of the town and owner of the local newspaper, he hires her to work at A Stitch in Time, his grandmother Eugenia’s quilting shop. Eugenia is slowly deteriorating as Alzheimer’s is taking its toll, and Conrad wants histories and photographs of the many quilts displayed at the shop before they are lost forever to the disease. Slowly Jillian starts to understand the locals with the treasure trove of information that Eugenia’s stories reveal, and her ability to capture both the charm, detail and images of the quilts, and her gentle way of coaxing the stories from the tangled web that is his grandmother’s memory have Conrad excited and impressed: hoping to convince Jillian that there is a place and opportunity for her in the small town. Told in multiple points of view, where the timeframes aren’t always clearly defined, the narration for this story takes some getting used to but this also works to help build gradual pictures (visual and impressions) of the various people in the community and their stories. With a lovely sense of the ‘getting to know’ the town, the small community opens up to Jillian through Eugenia’s stories, the quilts and their own reminiscing about moments that have “become a part of their story.” Using the art and lore of quilts, the fabrics, patterns, stitches and intended use, the quilts become characters in and of themselves, a tangible representation of lives and times to last beyond their last breaths. A lovely story that engages and reminds us of the ties that can bind people together through years and miles: revealing truths that don’t always relate to the questions we have, but show that family is often what you make when you aren’t intending to. Jillian James has never had a place she could call home. 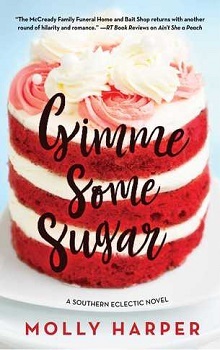 So when she lands in the sleepy Texas town of Laurel Springs, she’s definitely not planning to stay—except to find a few clues about the father who abandoned her and destroyed her faith in family. Connor Larady is desperate: he’s a single dad, and his grandmother, Eugenia, has Alzheimer’s. He’s the only one around to care for her, and he has no idea how. And now he has to close the quilt shop Eugenia has owned all her life. When Connor meets down-on-her-luck Jillian, he’s out of options. Can he trust the newcomer to do right by his grandmother’s legacy? Jillian is done with attachments. But the closer she grows to Connor and Eugenia, the higher the stakes of her leaving get. She has to ask herself what love and family mean to her, and whether she can give up the only life she’s ever known for a future with those who need her. A copy of this title was provided via Publisher Via Edelweiss for purpose of honest review. I was not compensated for this review: all conclusions are my own responsibility. A fifth-generation Texan, JODI THOMAS sets the majority of her novels in her home state. With a degree in Family Studies, Thomas is a marriage and family counselor by education, a background that enables her to write about family dynamics. Honored in 2002 as a Distinguished Alumni by Texas Tech University in Lubbock, Thomas enjoys interacting with students on the West Texas A & M University campus, where she currently serves as Writer in Residence. 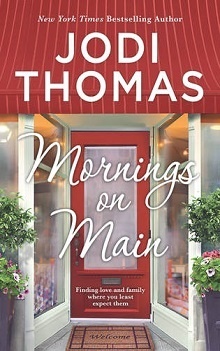 When not working on a novel or inspiring students to pursue a writing career, Thomas enjoys traveling with her husband, Tom, renovating a historic home they bought in Amarillo, and "checking up" on their two grown sons.